ANTIPHONARIUM -Leaf on vellum from a antiphonary. ANTIPHONARIUM - Leaf on vellum from a antiphonary. 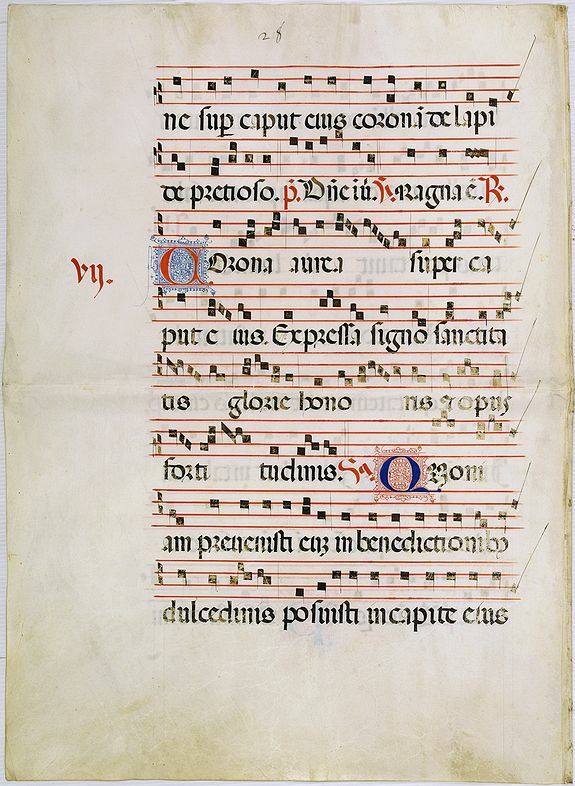 Title : Leaf on vellum from a antiphonary.. Size : 22.0 x 15.9 inches. / 56.0 x 40.5 cm. Description :A leaf from a Medieval Antiphonal or Choir Missal for Spanish use, in Latin on extremely heavy vellum. Justification: 410x270mm. Text is in Spanish rounded gothic hand (Rotunda) and of music on a stave formed of four lines in red. RECTO: There eight lines of music and verse in black ink and partial lines of commentary in red and black ink. With three large initials coloured in blue or red on a ground in filled with geometric and floral patterns coloured in blue or red. VERSO: There are eight lines of music and verse in black and red ink and two large initials in black and red . Condition : Boldly hand-written in a , Gothic rotunda, with text lines and music staves, on a large sheet of sturdy vellum. Horizontal folding in middle of leaf. Thumbing of frequent use on the right hand corner.